Anonymous. Quinarius, 1.76gg. (7h). 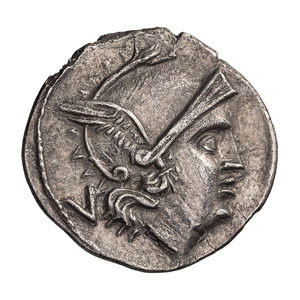 Apulia, 211-210 BC. Obv: Helmeted head of Roma right, mark of value V behind. 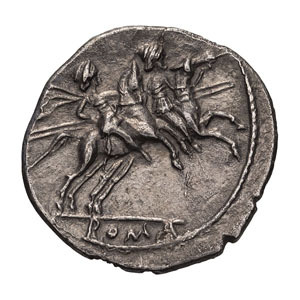 Rx: Dioscuri galloping right holding spears, each with star above head, ROMA in exergue. Crawford 102/2d. EF. Ex Philip T. Ashton Collection. Ex Gemini I, 11 January 2005, lot 274. In style of issue marked with Q.